Imperial Assault offers a different game experience in the skirmish game. In skirmish missions, you and a friend compete in head-to-head, tactical combat. You’ll gather your own strike force of Imperials, Rebels, and Mercenaries and build a deck of Command cards to gain an unexpected advantage in the heat of battle. Whether you recover lost holocrons or battle to defeat a raiding party, you’ll find danger and tough tactical choices in every skirmish. 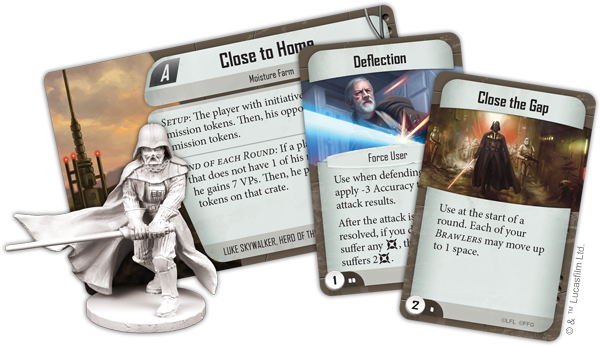 As an additional benefit, the Luke Skywalker Ally Pack and the Darth Vader Villain Pack are included within the Imperial Assault Core Set. These figure packs offer sculpted plastic figures alongside additional campaign and skirmish missions that highlight both Luke Skywalker and Darth Vader within Imperial Assault. With these Imperial Assault figure packs, you find even more missions that allow your heroes to fight alongside these iconic characters from the Star Wars saga. 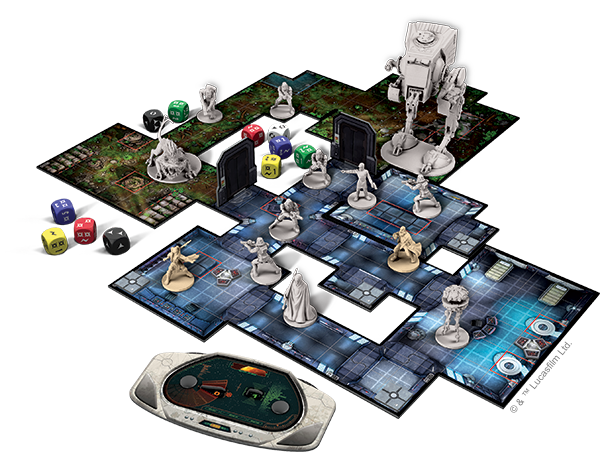 Each game of Imperial Assault takes place during a cinematic mission. The objective of your mission can be nearly anything: recovering a critical data core, working with Chewbacca to steal crates of lucrative spice, or escaping bounty hunters eager to collect the price on your head. Whether you’re infiltrating an Imperial base or helping Luke Skywalker escape Imperial entanglements, every mission offers more danger and excitement. The boards for these missions are constructed using over fifty double-sided, interlocking map tiles that combine to construct a massive variety of Star Wars environments. You may find yourself bushwhacking through the jungles of Yavin 4 or sneaking into a dusty cantina on Tatooine. 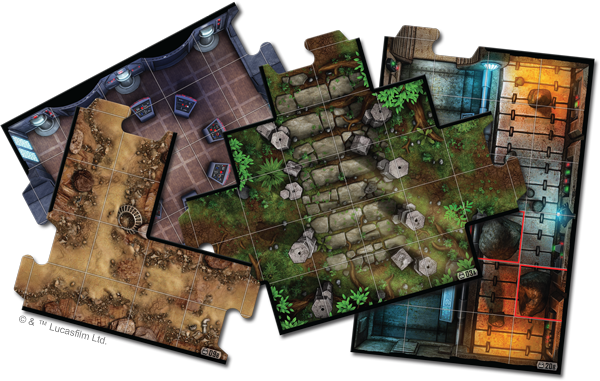 Whether you stride through the gleaming corridors of an Imperial base or make your rendezvous in a dirty factory on Nar Shaddaa, you’ll need to consider the terrain and the lay of the land as you play your missions in Imperial Assault. Once a mission begins, players alternate activating a single figure or squad of figures. Each figure receives two actions to move, attack, open doors, investigate crates for useful supplies, or rest to recover strain and damage. When you choose to move a figure, it gains an amount of movement points equal to its speed, and can spend them at any point during its turn, allowing your figures to open doors and keep running, or fire a blaster before ducking behind a corner. In addition to gaining movement points, heroes in campaign missions can exert themselves by taking strain. Taking strain allows your hero to move additional spaces or trigger special abilities. Positioning is crucial, but decisive attacks lie at the heart of both campaign and skirmish missions in Imperial Assault. Figures attack and defend by rolling attack dice and defense dice and comparing the amount of damage rolled against the number of blocks rolled. 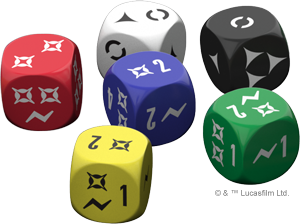 Surge icons on the dice represent impressive feats of combat prowess that allow you to trigger your figure’s powerful surge abilities, but these surges can be cancelled by your opponent’s evade icons. An attack might even miss entirely if you roll the dodge result! Different weapons allow you to make ranged and melee attacks, and roll different attack dice. As you move and attack in the campaign game, crates located around the battlefield can provide your heroes with a variety of helpful items. You may find grenades to throw at encroaching Imperial squads, bacta infusions to heal your wounds, or comlinks to radio false alarms. If you can’t find the healing equipment you need in crates, however, your heroes may need to rest. Resting removes strain and damage, but it takes precious time away from battling Imperial soldiers and attaining your objective. You must balance the necessity of rest against the need to push on before the Imperial player brings new squads of enemies against you. In the campaign game, you and your friends take on the roles of one of six heroes of the Rebellion, such as a smuggler, a veteran soldier, a Wookiee warrior, or even a Force user. Throughout the missions of the campaign, you continue to play one hero, gaining experience, new skills, and upgraded weapons and armor as the campaign goes on. You play these heroes throughout a campaign, even working with iconic characters like Han Solo and Luke Skywalker in some missions. Opposing the Rebel players, a single player commands the forces of the Empire, including stormtroopers, probe droids, massive AT-ST walkers, Trandoshan mercenaries, and terrifying villains such as Darth Vader. As the Imperial player, you can draw upon the limitless resources of the Galactic Empire, increasing your threat every round and summoning reinforcements to keep the heroes from reaching their objective. In addition, Imperial Class cards allow the Empire to expand its power and gain new abilities over the course of the campaign. As you complete campaign missions, your options for future missions change based on the outcomes of past missions, ensuring that you’ll never play the same campaign twice. You may be forced to take unexpected side missions when your ship is impounded, or if you’re captured during a raid on an Imperial base. Wherever the heroes battle in Imperial Assault, they must take care to not become distracted from their objectives. The resources of the Galactic Empire are truly limitless, and every round the heroes delay increases the Imperial player’s threat dial. As the Imperial player, you can spend threat to replenish your squads or summon reinforcements, overwhelming the small team of Rebel operatives if they fail to accomplish their goals quickly. In campaign missions, the Imperial player also has the advantage of knowing every secret that awaits as the mission progresses. The Rebels know only their next objective, and any number of surprises may lie ahead. Rebel Intelligence agents may discover Imperial codes behind a door, for example, but you won’t know if the codes are unguarded or if the open door will reveal a squad of stormtroopers. The campaign also invites both the heroes and the Imperial player to gain new skills and abilities. The Imperial player can focus on maximizing the Empire’s strengths, such as military might, technological superiority, and subversive tactics. The heroes, on the other hand, can learn new skills and abilities by spending experience to gain Class cards. Your heroes can also invest in powerful weapons and equipment with the credits they collect. You can battle with a vibroblade or an A280 blaster rifle, and add modifications to give your weapon a personal touch. 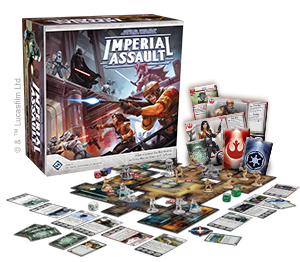 In addition to the campaign game, Imperial Assault offers a skirmish game that invites you and one friend to engage in head-to-head skirmishes. While playing a skirmish mission, you and your friend muster your own strike teams of soldiers, drawing on Imperial, Mercenary, or Rebel units. Command cards give your warriors unexpected bonuses, and since you build your own decks of Command cards, you can specialize your deck to support your team, whether you focus on troopers, brawlers, or hunters. In every skirmish mission, you clash with your opponent in a battle of tactical skill and combat. Both players alternate activating a single deployment card and taking actions with the associated figures as they battle to complete conflicting objectives. Whether you’re competing to steal a valuable T-16 Skyhopper, or collecting contraband on behalf of the Hutts, the skirmish game offers tense, tactical battles in the Star Wars universe. As a bonus, the Imperial Assault Core Set includes both the Luke Skywalker Ally Pack and the Darth Vader Villain Pack. Both of these packs include a sculpted plastic figure to replace the token found in the Imperial Assault Core Set. 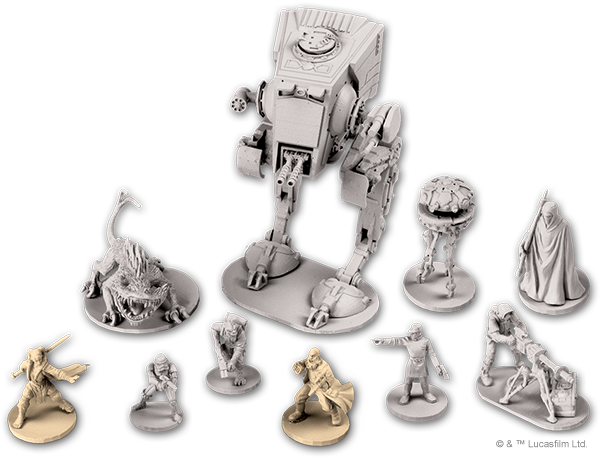 In addition to the detailed plastic figure, each figure pack includes two skirmish missions using the same map and a campaign side mission highlighting the character included in the pack. You may gather new recruits for the Rebel Alliance or hunt down Luke Skywalker with Darth Vader using the missions included in these figure packs. 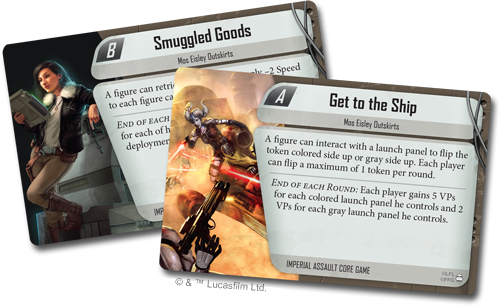 Whether you complete missions for Rebel High Command or seek to destroy the Rebels on the behalf of the Galactic Empire, Imperial Assault invites you to step into the Star Wars universe. Play in a series of campaign missions and gain experience and items with up to five players, and play the head-to-head skirmish game with a friend, mustering your teams and clashing over key objectives. Gather your strike force or ready your stormtroopers, and prepare for Star Wars adventure!